The results are in! In case you missed the buzz on social media, I thought it would be a good idea to highlight the winners of the 2015 ProZ.com community choice awards here. This initiative is held by ProZ.com on an annual basis (2015 being the third year) in an effort to recognize and celebrate those language professionals who are active, outstanding, or otherwise influential in various media throughout the industry. Results are split into two categories: translation-related and interpreting-related. Nominations, voting, and winners are determined entirely by the ProZ.com community. So who did the community choose as this year’s award recipients? A special congratulations to Marta Stelmaszak of WantWords who took home an incredible 7 awards this year, beating the record she set last year. Congrats, Marta! *Categories marked with an asterisk indicate tied results. Aida González Del Álamo won the award for best interpreting-related blog for the third year in a row. Congratulations, Aida! I am also pleased to announce that 2015 marks the first year that sufficient votes were received to select winners in every interpreting-related category. Come celebrate International Translation Day with ProZ.com by attending the site’s annual 2-day virtual conference series! These events are free to attend and include panel discussions, training sessions, on-demand content, group discussions, special discounts and software savings, live chat with exhibitors and more. You can register to attend by clicking the “Click here to register” link on the virtual event series page: http://www.proz.com/virtual-conferences/group/26. Once you’re registered, visit the “My data” tab to add details to your personal bio, as well as a message/greeting to fellow attendees. For a full list of tips and pre-event information – ranging from setting up your computer to deciding which sessions you will attend – visit: http://www.proz.com/virtual-conferences/668/prepare. For even more advice on getting ready to attend a virtual event, be sure to check out this past blog post: “Translation events 101: Virtual events”. Don’t forget to stop by the ProZ.com support booth located under the “Exhibitors” tab for a chance to win one full year of ProZ.com membership! Just a few days remain in the voting phase for this year’s installment of the ProZ.com community choice awards. Cast your ballots and help pick this year’s winners before voting ends on September 22nd here: http://www.proz.com/community-choice-awards/nominations. Nominees and winners are determined entirely by the ProZ.com community. Now, as the purpose of the ProZ.com community choice awards is to celebrate those who are active and influential in different media throughout the industry, I thought it would be fitting to share some of the social media responses to these awards here. Carol’s Adventures in Translation – a blog by Caroline Alberoni of Alberoni Translations – is in the running for “Best blog” among the translation-related finalists for this year’s awards. Congratulations and best of luck, Caroline! Laura Hargreaves has done a fantastic job of covering this year’s ProZ.com community choice awards both on her blog – LanguagesByLaura.com – as well as via Twitter @LanguagebyLaura. Thanks for the support, Laura! Translators Anonymous – an anonymous (and hilarious) translation blog – were the original winners of the “Best blog” community choice award. I had a lot of fun interviewing them on that win here: The ProZ.com community choice awards: Translators Anonymous. They are in the running this year as well for best blog, Facebook page/group, and the “other social media” category. Good luck, admins! The awards have been mentioned on a variety of different social media platforms, including this Pinterest pin by Chiara Bartolozzi of One Sec Translations. She also wrote a post about the event in her blog here: #ProZCCA: Community Choice Awards 2015 hosted by ProZ.com. Chiara is a nominee in a few different categories including best Twitter, blog post, and “other social media”. Thanks for the mentions and best of luck, Chiara! Erik Hansson – owner of the Things Translators Never Say Facebook group – has promoted the awards, as well as his group’s nomination in the best Facebook group/page category, throughout social media. Be sure to check Erik out via Twitter @erik_hansson. Good luck, Erik and the Things Translators Never Say group! Pieter Beens has been nominated in two award categories this year, including best article and best blog post. You can see both of these nominated posts on Pieter’s website, Vertaalt.nu. Congrats and good luck, Pieter! Did I leave anyone out? Use the comments section below or tweet me @ProZcom with a link to your social media post on the 2015 ProZ.com community choice awards. This year’s winners will be announced on International Translation Day, September 30th. Come celebrate the day with ProZ.com by attending our annual virtual event! And don’t forget to spread the word about the awards on social media using the hashtag #ProZCCA. Questions, comments and feedback on this post are welcome. Happy translating! This is the second time ProZ.com has hosted a charity event benefiting education programs for children in need. During the month of June, the site held four free translator training webinars to help raise funds for Concern Worldwide education programs. 72 million children around the world are not enrolled in school, and Concern Worldwide focuses on providing basic education to those who need it most. For over 30 years, this organization has been working to improve access to basic education among the poorest people in the world. Concern Worldwide currently spans 12 countries, benefiting 215,888 people last year alone. Access to education is not only a basic human right, but also a key factor in reducing poverty and child labor in the world. By attending the event, donating, and conducting sessions, ProZ.com translation professionals have helped to ensure that children learn basic literacy, numeracy, and life skills in school through the Concern Worldwide education programs. Concern Worldwide supports teacher training, school materials supply, and strengthening school systems. Their aim is to improve access to primary school for marginalized children throughout the world, especially among young girls. ProZ.com trainers Anneta Vysotskaya, Irene Koukia, Gwenydd Jones, Suzanne Deliscar, and Claudia Brauer generously offered their time and experience to conduct online sessions for free in support of this cause. Four online sessions were held for freelance translators to help them in developing their skills, choosing an education program and learning how it can assist them in their careers, expanding their horizons through volunteer programs, and developing strategies to grow their businesses and stand out from the crowd. With more than 150 registrants for each session, attendance increased sixfold in comparison with the charity event held in 2013. It is amazing how people throughout the world gathered together in support of children in need. ProZ.com matched each donation made, and together we reached the donation drive goal. Thank you to all who contributed to this great cause. Special thanks goes to James Xia for his support of this event. Is an MA in translation the right choice for me? Thanks to all the trainers and attendees for their fantastic fundraising efforts which made a big difference in the lives of children! We hope to see you all at upcoming ProZ.com training sessions and charity events to be conducted in the future. 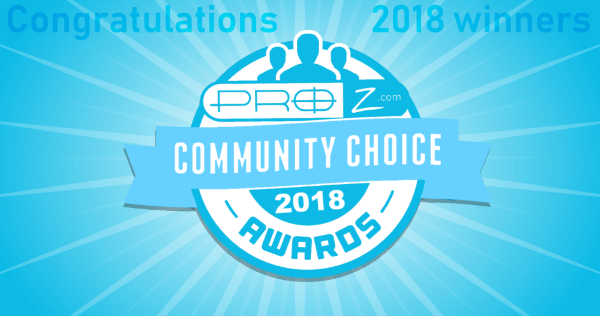 What are the ProZ.com Community Choice Awards? They are a means through which members of the ProZ.com community are able to publicly recognize those language professionals who are active, influential, or otherwise extraordinary in various media throughout the industry. There are two main award categories: translation-related and interpretation-related. Within these categories are various sub-categories such as best blog, best website, best trainer, and best conference speaker, to name a few. The Community Choice Awards are hosted by ProZ.com on an annual basis, this year being the second one of its kind. Nominations, voting, and winners are determined entirely by the ProZ.com community. If you are a member of the site, you can participate in the Community Choice Awards. Don’t have a profile with ProZ.com yet? You can register with the site for free here. How can I nominate recipients for this award? Simply visit http://www.proz.com/community-choice-awards/nominations to get started in nominating this year’s award recipients, or to propose additional award categories (you will need to be logged-in to participate). Don’t wait, the nomination phase will be ending soon! When will I find out who won? Nominations may be submitted through August 14th. The voting phase will then commence on August 20th and last until September 22nd. The winners of this year’s Community Choice Awards will be announced on September 30th, just in time for International Translation Day. Where can I go to see last year’s winners and learn more about this event?